A popular land-based slot already, IGT's online adaptation is a professional piece of workmanship. Played with the developer's 1,024 ways-to-win system, Red Mansions is firmly set in a world of beautiful Geishas, emperors and lotus blossom - lots of lotus blossom. Like their Egyptian-themed Crown of Egypt slot, there are two ways to play this Multiway Xtra slot: play with 40 pay-lines, or play the standard 40 paylines with half your bankroll and play the 1,024 all ways betting pattern with the other half. That means that when playing the MultiWay Xtra way each symbol position acts as a separate reel. 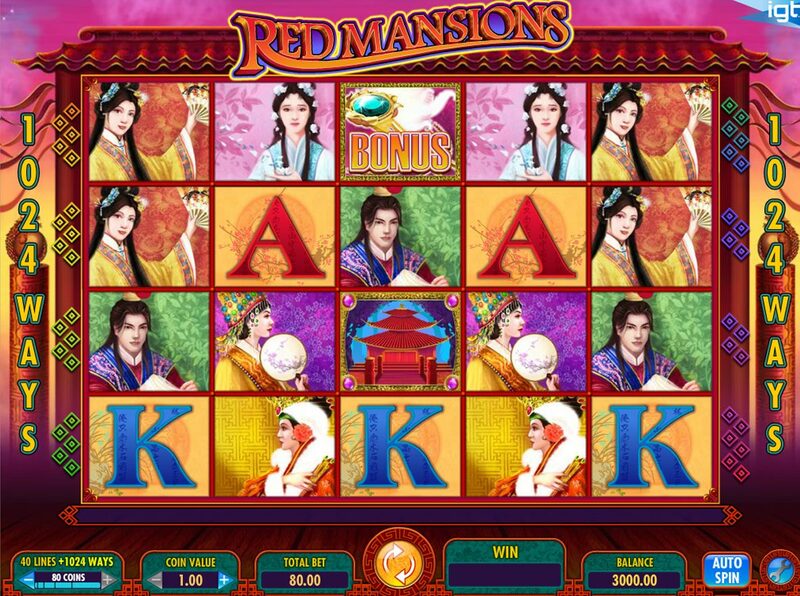 In terms of symbols, it's pretty much what you'd expect from a lush Oriental-themed slot: various Japanese princes and princesses in various poses, plus some Oriental-styled Jack-to-Ace symbols. The red mansion is the Wild symbol and substitutes for all regular symbols. It only appears in the last four reels also. Two or more BONUS jewel symbols on the third reel anywhere will trigger the free spins bonus round. You can win 10 to 20 spins, depending on how many Scatters you landed to trigger the bonus feature. You can win more free spins by landing two or more further green BONUS icons on reel 3. 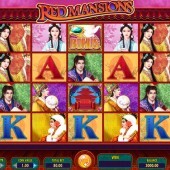 There's no doubt that Red Mansions is one for fans of lovely-looking slots. The reels spin majestically throughout and come to a stop with a satisfying flurry. But despite there being four rows I found it really hard to land even one BONUS icon on reel 3. Considering there is only one bonus round in the game, it's not good enough. The MultiWay Xtra system is certainly good for action junkies (remember to whack that betting gauge up to the max. 40 paylines + 1,024 ways) but I'd hunt out IGT's other games within this stable - Crown of Egypt and the history-themed Treasures of Troy are more satisfying overall.